The people are warm and passionate, thoughtful, caring, professional at their jobs and organized. It’s been great, and I can't wait to go home tomorrow. Shirley Stroschein was admitted Pigeon Forge Care & Rehabilitation Center after a hip replacement surgery. 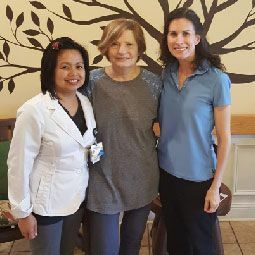 Shirley’s motivation and active participation in achieving her goals together with Signature HealthCARE therapists played an important role towards her successful discharge home. Congratulations Shirley, and thank you for choosing Pigeon Forge Care & Rehabilitation Center!